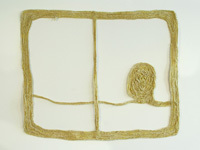 Every summer FiberScene renews its commitment to MFA Graduates in the field of Fiber Art. This summer’s response has been especially strong, so we have elected to divide the show in half in order to give all our artists ample space to display their work. This month’s artists are Erin M. Riley (Tyler School of Art, Philadelphia, PA), Amy DiPlacido (Cranbrook Academy of Art, Bloomfield Hills, MI), Emily Soldin Howard (East Carolina University, Greenville, NC), Emily Wolf (University of Massachusetts-Dartmouth), Elizabeth Bentley (University of Massachusetts-Dartmouth). 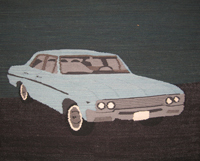 Erin M. Riley’s beautiful tapestries of old cars and trucks in turn become expressions of death and destruction. Amy DiPlacido’s mixed media installations “explore the concepts of color, language, and space,” often with humor, frequently as rebellious commentary. 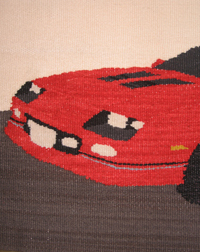 Emily Soldin Howard transforms family memorabilia into new life cycles and histories. Emily Wolf expertly hand dyes and spins natural fibers for her installations that probe existential questions. 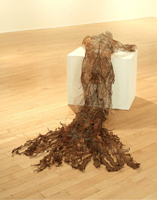 Elizabeth Bentley Combines copper wire and natural fiber to knit unfinished female forms—echoes of her sympathy and support for women’s issues. 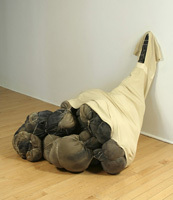 Part II of our sizzling summer MFA Show continues August 15-September 15,2009, with work from RISD and CCA Graduates. Hand-dyed fabric with chemical and natural dyes, decomposed fabric, wax, plaster, clay, wood, felt and found objects. copper wire, wool, silk, cotton and rayon yarns. copper wire, silk and rayon yarns.